@mr.supercar the RTR is a Mustang GT dealer variant honoring the Drifting Competitor Vaughn Gitten. RTR stands for "Ready To Rock". Apparently that is something he says a lot and it has become his slogan. 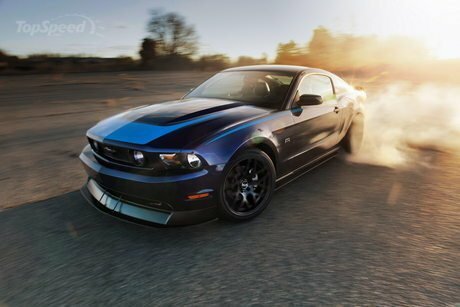 A Motor Trend driver (or typical Mustang owner) should get 0-200 kph in about 16.3 seconds. Kinda weird, the ultra slow shifts. I try to be gentle on my shifts, especially first to second, but the Sport Auto driver seems to be slower than me. The Motor Trend drivers on the other hand seem to have mastered shifting Mustang transmissions. The acceleration between shifts seems to be the same, only the shifting skill is different. 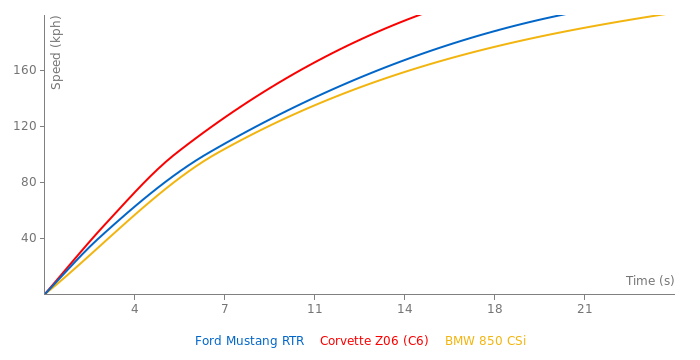 It is enough of an advantage that Motor Trend gets to 180 kph (111.6 mph) in only 12.7 seconds in a standard Mustang GT 5.0 versus Sport Auto's time of 14.0 for the RTR dealer variant. This is still just a dealer option of the Mustang GT 5.0 with the same curb weight and with only an added 10 ps in horsepower. Looking at the acceleration figures, it is obvious that the test driver lost a lot of time with every shift. Road and Track test drivers also seem to get very slow shifts with Mustangs. However, the power is still evident in the time between 180 kph and 200 kph: only 3.6 seconds. That of course is in 5th gear. I just added some more acceleration times from Sport Auto. They certainly didn't launch the car well. The 0-100 kph of 5.4 is quite a bit slower than the 4.6 quoted by other magazines for the Mustang GT. However, once they got it going it accelerated quite well from 100 kph to 200 kph. Maybe the Falken tires are not as good as the Pirellis for getting a good launch. @Georg since my German isn't as good as yours please correct anything that I may have misread in the Sportauto test. Thanks. I forgot to mention, it also uses different tires. Falken is Vaughn's sponsor, so this RTR package uses their high performance summer tire rather than the standard Pirelli PZero. I don't believe Falkens are better than Pirellis, but I could be wrong. This is a dealer installed option package for the Mustang GT. It is in honor of a drift competitor, Vaughn Gitten. It is mostly cosmetic, but has different exhaust, springs, shocks, and air filter. The RTR stands for Ready To Rock, something Gitten says a lot apparently. The RTR package costs about $7k, but isn't much quicker than other GTs. It has 10 ps (9 bhp) more than the standard variety.